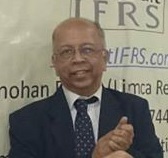 Bhave Sir is one of the best expert on IFRS today. He is a CA,CS,CMA and a Lawyer. He has an Industry experience of 3 decades. MeraSkill is an Online Learning Platform, which conducts online courses.We are currently running courses on Diploma in IFRS, Import & Export, Service Tax, CA-CPT, CS-Foundation ,CMA- Foundation,.